Only 16% of American high school seniors are interested in a STEM career, and only about half of those who major in a STEM field choose to work in a related career (U.S. Dept. Of Education, 2015). In our competitive global economy, these statistics are unacceptable. Despite the well-documented need for early STEM career exposure and exploration (NRC, 2011), few tools exist to foster such interactions. Furthermore, there is a large interest and achievement gap among many groups in STEM, and minorities are seriously underrepresented in many STEM fields (NSF, 2013). These pervasive barriers limit subsequent participation in many well-paid, high-growth professions, and deprive the nation of the full benefit of these diverse talents and perspectives (President’s Council of Advisors on Science and Technology, 2011). According to the US Dept. of Labor Statistics, there will be 1 million new jobs in STEM by 2020. While the need for skilled STEM workers continues to increase, the availability of skilled STEM workers has remained stubbornly stagnant. Clearly there is a pressing need for engaging ways to promote STEM career development among youth, especially among first-generation, inner city, and rural students where access to role models engaged in such professions are limited (Roberts, 2010). Modern technological advances can now be harnessed to show students the STEM that surrounds them, encouraging the transfer of critical thinking and applied learning of STEM content and employability skills from the classroom to the unique and personal interests of each individual. To address the high demand and current shortage of STEM workers (Maltese & Tai, 2011), CareerInSTEM initiated a pilot online summer camp to equip diverse learners with the knowledge needed for a meaningful, rewarding future as a STEM professional. The intent of this pilot program was to expose students to a wide variety of STEM careers and provide hands-on practice of what people actually “do” in each career. Delivered 100% online, the program was facilitated by licensed STEM teachers in collaboration with real STEM professionals. Activities included the opportunity to go behind the scenes of real STEM work sites, talks with experts in the field, challenges to design and create engineering projects to solve world problems, and much more. Students joined from 11 different states, as well as two from Nicaragua. “At first I didn’t know if it would work. We are asking kids to give up some of their summer to learn – who wants to do that? !” CEO Ashley Pereira laughingly asks. “But the fact that we have had so many kids willing and eager to join speaks to the fact that kids around the world are interested in STEM, and are willing to go the extra mile for something they are passionate about. How do you know if you like something if you have never actually done it? That is the goal of piloting this online approach to summer camps – to provide students the opportunity to actually DO what real STEM professionals DO” says Pereira. As an example, the Engineering Summer Camp featured a mechanical engineering design challenge with Dr. David Giblin, Assistant Professor in Residence in the Department of Mechanical Engineering at UConn Avery Point Campus, an hour of code and interview with Yamilee Toussaint, CEO of STEM From Dance (a NYC-based nonprofit), and an introductory lesson on architectural floor plans from a construction company CEO. Through these experiences and more, students had the opportunity to do what real STEM professionals do, while interacting with diverse engineers in the field. The program also ran on-campus at Central CT State University. While nearly identical (content, ages served, facilitated by a licensed science teacher), the online program ranked equivalent or higher on all measures in the student post-survey. This is an interesting finding, and underscores the potential of online STEM programs as a viable option to scale up access to STEM career preparation. All that is needed is an internet connection! With online STEM programs such as this, ‘knowing someone’ is not required. Regardless of available resources, students were connected with individualized career details including necessary skills/education, interviews, mentors, and other resources to help them learn about STEM careers in a more personalized, experiential way than is typically found in traditional forms of career guidance. 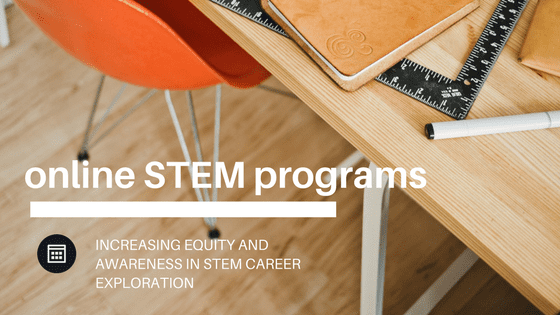 Through this approach, equity and awareness of STEM careers were increased; anyone, anywhere was able to participate. Due to these promising results, this online STEM program will be expanded to 10 different offerings throughout the 2017-18 school year. Students can join as an individual or as part of a group (discounts available). To learn more about each course click here. We hope you will join us in exploring this promising new movement in STEM education!